Photographer: Graham Saunders © SNH. All rights reserved. Flickr. Yesterday we began a serial feature from Open Seas which showcases a few of Scotland’s crucially important seafloor species, their history in Scotland’s seas, and what the future may hold. Native oysters, horse, fan and blue mussels, serpulid reefs, flame shells, seagrass, maerl, gravels with burrowing sea cucumbers, cold water corals and Scotland’s seafan and sponge communities each play a key role in our seas. Telling their story gives an insight into the history of our seas more generally – and hopefully inspires us to think about where we can go in the future. Welcome to Part 2: Native Oysters. As well as being a food source, oysters can play an important role in the way our marine environment works. In the wild they typically live up to 10 years and spend that entire time connected to the gravelly, stony bits of the seabed where they form large masses of interwoven shells. As they grow, mature, reproduce (each female generating more than a million eggs) and die, they begin to create a solid reef structure on the seafloor – an interconnected mass of shells which adds to the complexity of that bit of the sea. By filter-feeding the passing seawater they are also filtration powerhouses and help clean up the sea. A single oyster can filter 240 litres of water every day! Combined these effects create the conditions for a range of other species to thrive and survive. 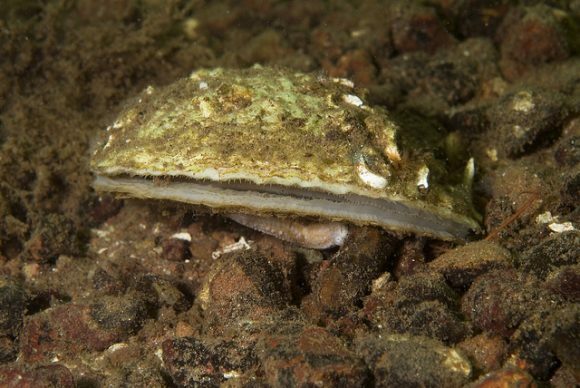 Oysters were once very very common around Scotland’s coasts, huge beds were found in our wide eastern firths and sheltered west coast sea lochs. The Firth of Forth is widely known to have been the largest such native oyster bed anywhere in the world, covering more than 150 km2. They were an integral part of Scotland’s seafood and were an important food source ever since our coastlines were first populated – archaeological surveys in the Inner Forth found that, not only were they consumed in huge quantities stone age forebears, the shells were sometimes used to build their homes! A dredge fishery developed to harvest Scottish oyster grounds in the early 1700s using heavy rakes similar to modern day scallop dredges. Unlike today’s dredgers, these were pulled by four men rowing in a boat – sometimes singing ‘interesting’ songs about the oysters whilst they did so. By the late 1700s they were hauling as many as 30,000,000 oysters a year from the Firth of Forth alone, feeding thousands and creating a booming export market with the oysters being sold to London, Europe and beyond. Photographer: SNH © SNH. All rights reserved. Flickr. Unfortunately the fishery was beset by problems and never properly managed and, although the fishers, councils, governments, the Crown and others all tried their approaches to keep the catch within sustainable limits, unfortunately none succeeded. Boats began overfishing grounds, selling small oysters that had yet to spawn to foreign traders, and overexploiting each other’s grounds. The lack of any sensible management led to a collapse of the fishery and massive clashes between fishermen as they fought for shares of a smaller and smaller stock – groups from Newhaven and Cockenzie once fought fists, oars and clubs all the way from one side of the Forth to the other! The Forth, which once provided 30 million oysters a year, reduced to 1.3 million in 1870, 0.4 million by 1880s and only 1,200 by 1894. The beds were eventually so depleted and individual oysters so distant from one another that the species stopped being able to effectively reproduce and the species was lost entirely from the area. Similar stories played out around the rest of our coasts. Today there are no known records of native oysters remaining in the Firth of Forth. The only place where a sustainable wild fishery remains is in Loch Ryan on the west coast, where the loch was restocked in the 1950s and 60s, and the Loch Ryan Oyster Fishery Co established with strict management rules. Further work, underway right now and led by the Marine Conservation Society, scientists from Heriot Watt University and whisky distillers Glenmorangie, is hoping to also recover the beds in the Dornoch Firth, just as was done successfully in Loch Ryan. 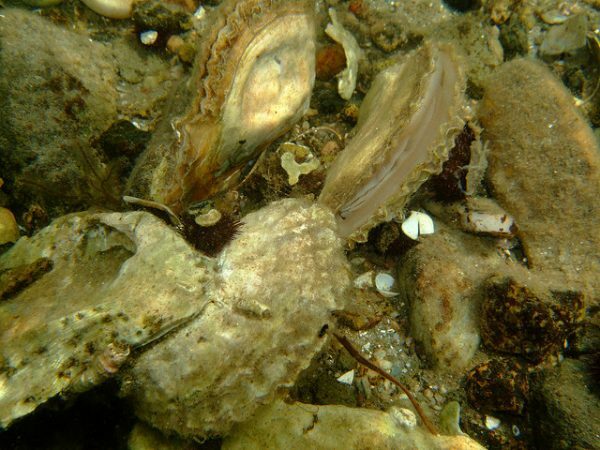 Isolated pockets of oyster beds and individual oysters remain in a handful of places. However, in each case these are now isolated and very small. Records can be found in the waters around Mull, in the sea lochs of Skye, Loch Ailort, and around in Orkney and Shetland. Nearly all are very near shore areas, often less than 5m depth, restricted by the fact that many of the areas of suitable habitat do not have good enough water quality or are regularly damaged by other fishery activities. There is growing momentum behind calls for widespread restoration for oysters around our coast. Check back tomorrow for Part 3: Horse Mussel Beds! If you missed Part 1 – see here!